Once again, THE CIRCUS WAS IN TOWN! 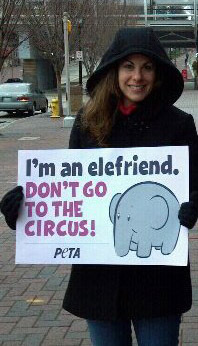 You may have even considered joining a circus protest yourself, but felt a bit hesitant. On TV we see people at demonstrations being handcuffed and arrested. We’ve all seen or heard about some of the more outlandish PETA publicity stunts, such as women going naked to protest wearing fur. I’ve driven by anti-abortion protesters waving graphic signs and bloody baby doll parts. And I’ve been yelled at by street preachers uptown, warning me about the evils of a play at the Blumenthal or a concert at the Arena. That makes protests and demonstrations seem a little scary. And the protesters, a little weird. 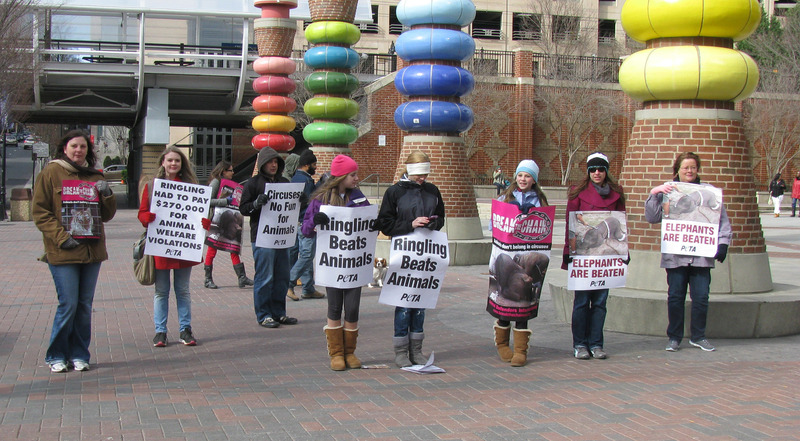 So, I’d like to take you “behind the scenes” with me at the Charlotte, NC Ringling Brothers and Barnum & Bailey Circus Protest and answer some of the questions you may have about participating in a circus protest. 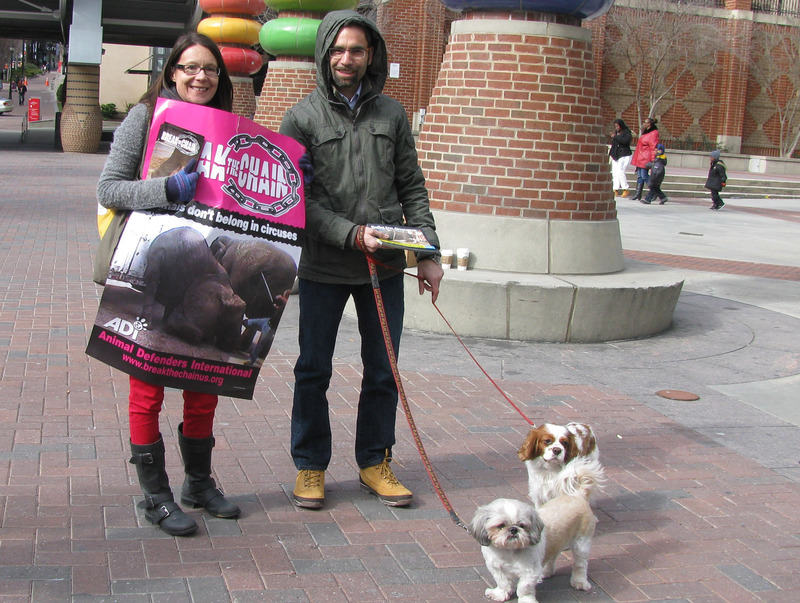 This particular circus protest February 2, 2013 was a joint effort organized by VegCharlotte, Marley of Charlotte Animal Rights, and Stacey of Charlotte Animal Welfare. Isn’t protesting illegal? I don’t want to go to jail! I was in charge of notifications and permits, and it turns out it is absolutely legal to peacefully protest on public property. If you have less than 50 participants and are not using amplified sound, you don’t even need a permit – you just need to notify the police department of your intention. If you have amplified sound or more than 50 people (or are thinking very optimistically! ), then you need a permit. The Charlotte Mecklenburg Police Department couldn’t have been any nicer or more helpful. I’m afraid I’ll feel out of place. Aren’t most of the protesters idealistic college kids? Or alternative hippie types? The crowd on Saturday was predominantly white and middle class. We did have one group of college students; most of the rest of us were in our 20s, 30’s, 40’s, 50’s. We came from a variety of fields – finance, IT, real estate. We had a registered dietitian and a CPA. We were a pretty attractive group of people, even if I do say so myself. It was probably about 75% female. Many couples came to protest together. Some people brought their dogs, some their toddlers. There were at least two mother-daughter protest teams. Most of us were vegan, a few of us were not. We even had an omnivore or two! But there are children at the circus. I don’t want to traumatize what is a happy event for them by waving graphic signs! 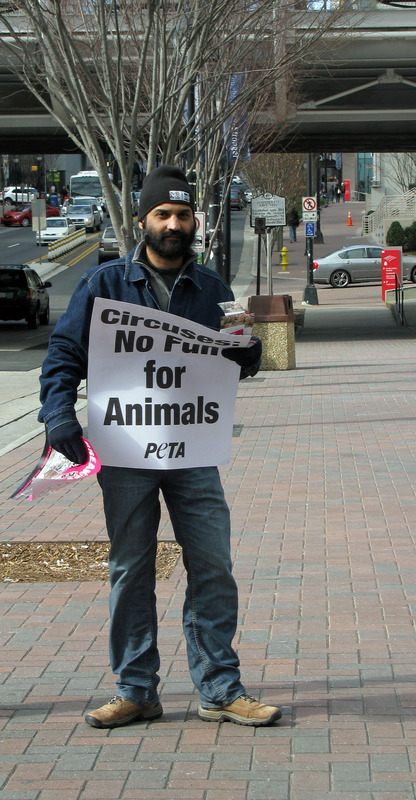 Stacey Havens, who’s led circus events in Charlotte for several years now, ordered our signs from PETA and Animal Defenders. The posters showed elephants and tigers rope and chained along with provocative text, but nothing very explicit. 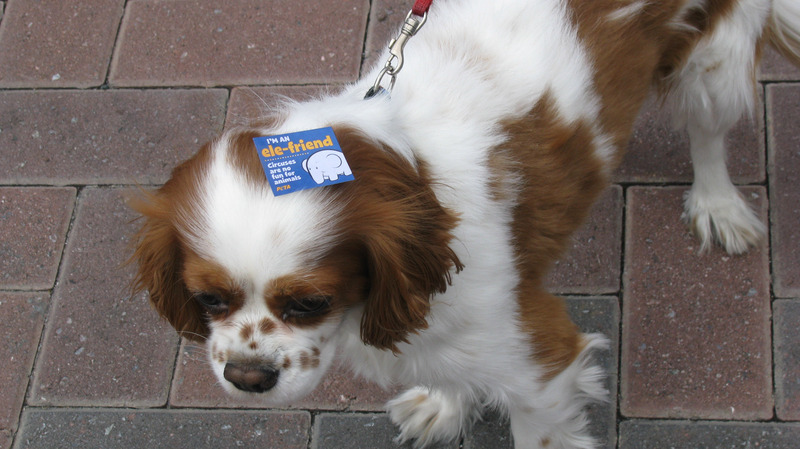 Our materials to hand out to children were cute little “I’m An Ele-Friend!” stickers and non-graphic coloring books geared towards teaching children empathy towards animals. But how did people act? Were they combative towards you? One woman screamed Democratic slurs at us. (???) Another woman walked by me and screeched, “Why are you SMILING?” (Because I was trying to look friendly and approachable?) Many people ignored us. Some people took pictures of us, like we were a tourist attraction. This was the morning shift. We’ll happily pose for you! I KNOW it makes a difference! 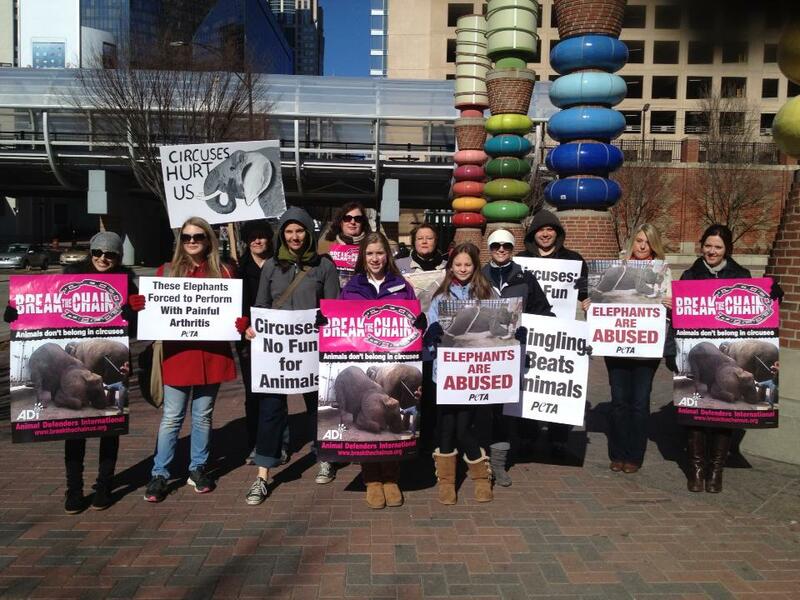 Stacey, well-known Charlotte animal activist and one of the leaders for Charlotte Animal Welfare, went to the circus as a child and saw a circus protest. She wound up joining the protest instead of going to the circus and has protested and organized protests ever since!!! My personal observations from Saturday – I saw one woman with two daughters who talked to Stacey and took a brochure before seeing the circus; afterwards the woman actually sought Stacey out and thanked her. “We enjoyed the show, but not as much as we would have otherwise.” She then said they were going to check out some of the links on the brochures and that they probably wouldn’t go to the circus again. Success! I personally gave away at least a dozen brochures and a coloring book. For some reason (at least as far as Amrik and I were concerned) African-Americans seemed to be the most responsive (or curious). Amrik in particular had a lot of success with young African-American men. A number of them approached him, asked questions, and walked away with brochures. So if you’ve been “on the fence” about protesting – I hope this helps you decide to JUST DO IT! For me this was a very positive experience – I felt like I was making a difference (or at least causing a few people to think!) and I enjoyed the companionship of my fellow protesters. Do it for the elephants. Do it for yourself. « VegCharlotte Awards – Veggie Burgers! Great job there, if I had known about it, I would have come up from Columbia. Animal abuse and violence effects everyone, not just vegetarians. Thanks for posting this and making the effort to educate people. Thanks, Barbara! Maybe you can join us next year! Oh, I’m so glad the article helped you! By this time you’ve already protested. I hope it was a rewarding experience for you! I’d be interested in hearing how it went!